We begin the week here at my Poetic Side with a look at the fifth season of poetry walks that have just begun in Washington. We also look at an article about a cane with a carving of William Wordsworth that will be going up for auction very soon. 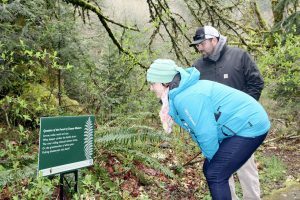 Washington’s Olympic National Park is to host the 5th season of poetry walks. These will take place along four of the trails located within the park’s perimeters. The trails will take place on Spruce Railroad Trail, Madison Creek Falls Trail, Hall of Mosses Trail, and Peabody Creek Trail. All of the trails will be free except for the Mosses tail. This year no poems will be placed along the Living Forest Trail as the visitor’s centre is not open while is it under renovation. Those visitors to the park who feel inspired enough to write a verse or simply snap a photograph whilst taking a poetry walk can visit the NOL’s Facebook page and share them or use twitter #FindYourPark. The poets who are featured along the routes through the park include Emily Brontë, Ogden Nash, Gary Snyder and Shel Silverstein. All of the local libraries will be offering hiking guides, trail maps, poetry volumes and wildlife guides. They will also have a selection of Explore Olympic backpacks which will be filled with a selection of items to help children discover nature – field guides, binoculars, etc. For the duration of the event, any family that checks out a backpack will be given a seven-day pass to Olympic National Park. The dates of the event are no coincidence, April is National Poetry Month and it is also when National Park Week takes place from 21stto 29th April. National parks week is celebrated in all of the national parks across the country and during this time all of the parks will offer free admission. A walking that has a carving of the face of a Lakeland poet is due to be auctioned on Tuesday (10th April) in Abingdon, Oxfordshire by Anthony Cribb. The cane which dates to the late 19thcentury has an ivory pommel which is decorated with a carved bust of William Wordsworth and a silver collar which is hallmarked London 1892, the makers mark E.R, the shaft is ebonised. The famous poet was born in Cockermouth lived in the Lake district his whole life. He went to school in Hawkshead before later settling down in Grasmere. It is expected that the cane will sell for between £100 and £150 at auction.